From left to right, JTD Hospital Foundation Executive Director Linda Haines; Woods Kemmler and Helli Kemmler; and JTDMH surgery department representatives Sheila Arnold, Chris Farr, Laureen Bruns, and Marge Doenges. ST. MARYS — “Socks for Surgery” is an idea which came as the result of a conversation had by Dr. James and Peggy Kemmler, along with their children, Woods and Helli. Both Kemmler children had surgical experiences when they were younger and had received fun pairs of socks that helped take their minds off the impending surgery and their fears. They saw the benefit of this and felt they could do something to help provide comfort to kids of all ages needing surgery by providing fun pairs of socks. 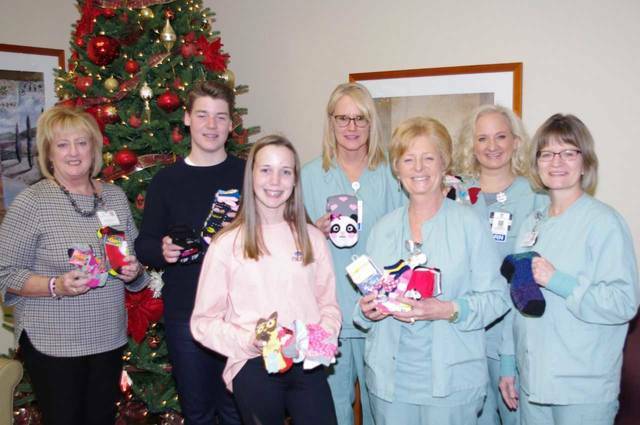 That’s when they started “Socks for Surgery.” They have decided to share their fun socks with pediatric patients in the Joint Township District Memorial Hospital for surgical procedures. Their hope is that these socks will provide comfort and lessen the fear of being in the hospital. Woods and Helli collected their socks by decorating cardboard boxes and placing them at local businesses, by asking school friends and family members. This year they collected 182 pairs of socks. https://www.sidneydailynews.com/wp-content/uploads/sites/47/2019/01/web1_socksforsurgery-1.jpgFrom left to right, JTD Hospital Foundation Executive Director Linda Haines; Woods Kemmler and Helli Kemmler; and JTDMH surgery department representatives Sheila Arnold, Chris Farr, Laureen Bruns, and Marge Doenges.